Unless you've been totally asleep or hiding under a rock, you're probably aware of the unrest in Baltimore over the police murder of Freddie Grey. Odds are that some of you are upset about the property damage that happened during the peak of the protests, and are amongst those calling for peace, just as was the case last fall when protests erupted in Ferguson, Missouri. Here's what I think. The United States is, by design, a nation of violence. It was born through the execution of genocide against Native populations, and was built in large part via theft and slave labor. Our domestic and foreign policy continues to be driven by endless forms of theft and violence, and people of color across the globe bear the brunt of it. Under these conditions, we should be applauding the fact that the vast majority of protests in Baltimore and elsewhere across the nation in recent weeks have been non-violent. Furthermore, white Buddhists and other spiritual practitioners would do well to restrain themselves from finger wagging at people of color led social movements that aren't conforming to their ideas about "Right action." I wrote the following in response to some comments on a post made by the Buddhist Peace Fellowship on their Facebook page a few days ago. White supremacy has infected the majority of white people living in the US to the point where they almost instinctively side with the mostly white ruling class. Otherwise known as the 1%. Every last calm, rational, dare I say "peaceful" attempt by people of color and their allies to illuminate the endless ways in which the three interlocked poisons of white supremacy, capitalism, and colonialism is met with another triple treasure: minimizing, denying, and victim blaming. And when the heat turns up to the level of revolt, including property damage and injuries, it's always fierce verbal resistance from the white masses, a ratcheting up of the oppressiveness from the state, and even more minimizing, denying, and victim blaming. White Buddhists have a fondness for making appeals for non-violence, and yet far too few are actively working to dismantle white supremacy, and the oppressive economic and social systems that were built to keep it in place, keep us divided, and guarantee that the ruling class stays in place. In meditation, we're often cued to watch for and unearth our habitual patterns. I have watched these patterns within the US Buddhist community and in the nation as whole unfold for a good generation now, but our history as a nation is built on this kind of call and response. There's never been a house that wasn't thoroughly divided, and riddled with the bullets of inequity, injustice, and systemic, cold blooded murders in the name of maintaining order. Whatever non-violent action has come in the past 500 years - and there has been much - has ALWAYS come against the odds, on land and air so saturated with violence that everything, right down to our water tables, is poisoned. If you're feeling compelled to condemn the breaking of windows, the burning of buildings, "black on black crime," the injuring of police officers, etc - how about instead taking a pause, and doing some deep reflection on the legacy of this nation. On the endless cycles of violence here and abroad that have led us to today. On all the ways in which the white supremacy that Frederick Douglass, Harriett Tubman, and so many others were resisting in Baltimore well over a century ago is the same white supremacy the protesters are resisting today. BPF's post contains an article from The Atlantic well worth the read. I'd like to that it's vitally important to remember that the non-violent social movements that many of us uphold as models - such as the U.S. Civil Rights movement - took years, if not decades to develop. And along the way, there were uprisings that included property damage, injuries, and even deaths. Living in a society that does everything in its power to divide and oppress, and make war and violent conflict seem normal and inevitable, every generation needs to learn anew how to build sustained movements grounded in a diversity of non-violent tactics. In addition, every new social movement is forced to counter the propaganda of the elite, which aims to render all tactics of liberation as violence. For example, many in the general public, especially amongst white folks, saw the freeway blocking or pop up lunch demonstrations in the months following the Ferguson uprising as illegitimate or somehow worthy of condemnation. Never mind that these are precisely the kind of non-violent tactics necessary to disrupt the narratives of white supremacy and get people talking about possible solutions. When all other avenues of gaining attention and working to address grievances are shut down, is it any wonder that people sometimes resort to property destruction and physical conflict? Like many of you, I long for a sustained social movement built on non-violence that leads us towards liberation for all. Let's make the effort to be allies to each other. Instead of assuming the worst of people that are out in the streets fighting for their rights, lets have a more generous understanding of what's going on. Which includes a knowing that there are already many individuals and groups within a movement like BlackLivesMatter working to build creative responses based in non-violent action. The mainstream media would have you believe otherwise, but then again, they're owned and operated by the very people that keep us divided and fighting amongst each other. 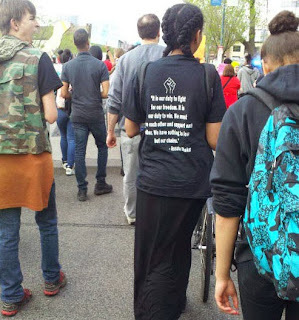 Yesterday, I was a part of our annual May Day march in Minneapolis (see photo), which this year merged with a rally and march for BlackLivesMatter. The crowd was highly diverse, and speaker after speaker pointed to the beautiful possibilities that could become reality if we come together, instead of remaining apart. 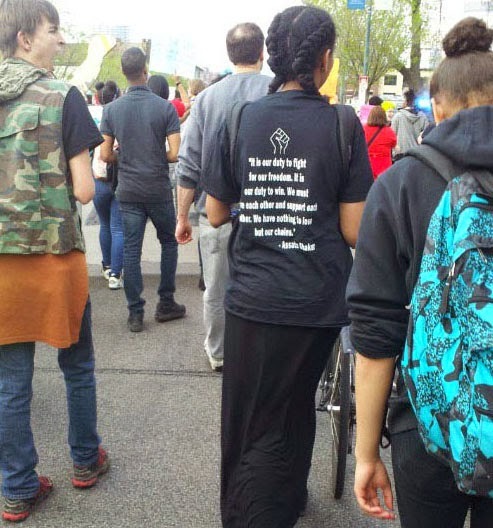 It's time for a critical mass of white American Buddhists and other spiritual practitioners to step up, be supportive, and join the #BlackLivesMatter movement in whatever ways they can.